So last year, as you probably recall, I lost my crap over Fangirl. It was not my first Rainbow Rowell book, but it was the first time I fell good and hard. After uneven results with Attachments, I just sort of avoided Eleanor & Park when it came out, despite its ridiculously charming cover. Then Fangirl came along with it equally adorable cover and I gave Rowell a second chance. It went so unbelievably, fantabulously well that I purchased a copy of Eleanor & Park before I even finished Fangirl, just knowing that skipping it had been a huge mistake. Possibly a fatal one. But it has taken me this long to get around to it, so afraid was I that it wouldn't live up to Fangirl. This book is an entirely different beast, to be sure. But I read it through from cover to cover the other night completely unable to stop. It was one of those rare and beautiful situations in which the level of my feelings for a book is so high that I feel an obligation to see it through in one sitting. Like I owe the book that much. I will follow a book that good through the deep, dark hours of the night, wherever it leads. I regret nothing. I am bleary-eyed, but unregretfully so. That girl—all of them—hated Eleanor before they'd even laid eyes on her. Like they'd been hired to kill her in a past life. - It's set in 1986. In Omaha. - It opens when Eleanor boards a school bus and no one will let her sit. - Until Park lets her sit next to him. - And they don't talk. - Until he realizes one day that she's reading his comic book over his shoulder. - And he stops reading it during the day so that when they get back on the bus to go home, they're still in the same spot and Eleanor hasn't missed a thing. I'm pretty sure that's all you need to know. As far as what my experience reading the book was like? 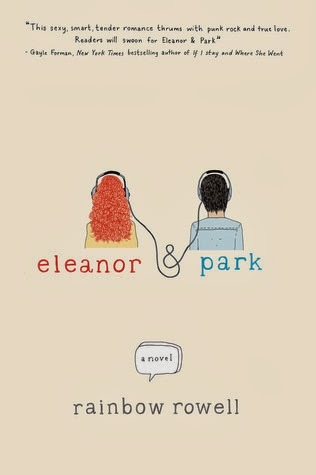 Quite simply, I laugh-cried my way through every page of Eleanor & Park. When I wasn't laughing or tearing up, I was quietly fixated, the air leaving my body in a whoosh multiple times as this depiction of first love (of so many firsts) had its way with me. It's been awhile since I spent the entirety of a book in such a heightened state. And I don't say that lightly. Rowell's words were always the right ones, and they so carefully sketched out and filled in her two leads that I was truly at their mercy. I worried going in that I wouldn't connect with one of them as well as the other. In a story told from alternate points of view, that can sometimes be a problem. I worried that Eleanor would be too . . . something, that Park wouldn't be . . . enough. I have silly worries sometimes, guys. But I admit I was utterly unprepared for how much I would love them both. I would read a book about just one of them, no questions asked. Just Eleanor stoically stumping her way through each day, snarking in English class, and taking terrifyingly quick baths. Just Park quietly passing at school, excelling at tae kwan do, and pretending his relationship with his dad isn't slowly killing him. I would read those books. But together? Put those stories together and I struggled to remember (or care) where I was. I was with them. Nothing else mattered. He wanted to ask her not to be mad right now. Like, anytime but now. She could be mad at him for no reason all day tomorrow, if she wanted to. "You really know how to make a girl feel special," Eleanor said. "I've never pretended to know anything about girls," he answered. "That's not what I heard," she said. "I heard you were allowed to have girl-zzz in your room . . . "
"They were there," he said, "but I didn't learn anything." They both stopped on his porch. He took her bag from her and tried not to look nervous. Eleanor was looking down the walk, like she might bolt. "I meant that you don't look any different than you usually look," he said softly, just in case his mom was standing on the other side of the door. "And you always look nice." "I never look nice," she said. Like he was an idiot. "I like the way you look," he said. It came out more like an argument than a compliment. "That doesn't mean it's nice." She was whispering, too. "Fine, then, you look like a hobo." "A hobo?" Her eyes lit. "Yeah, a gypsy hobo," he said. "You look like you just joined the cast of Godspell." "I don't even know what that is." She stepped closer to him. "I look like a hobo?" "Worse," he said. "Like a sad hobo clown." As soon as he said it, she broke into a smile. And when Eleanor smiled, something broke inside him. Golden, right? The way they have a care for each other, while still striking out when striking out is called for, and without lessening any of the very real troubles they deal with on a daily basis. The way they're so far apart and so believably afraid of the ramifications of their relationship. The way his thumb brushes her palm. The way she is strong and solitary and memorizes his face. The whole thing was an irresistibly struck note for me, ringing and throbbing and beautiful. The first time he'd held her hand, it felt so good that it crowded out all the bad things. It felt better than anything had ever hurt. And I'm just going to leave it at that quote. Because this book? This book feels better than anything ever hurt. Alexa Loves Books - "There is truly nothing I do not love about how their relationship developed." Book Harbinger - "It will be hard to forget these two." The Book Lantern - "Eleanor and Park is a love story, which packs sufficient punch to make you read it until the little hours of the night." Clear Eyes, Full Shelves - "I don’t believe this book." Cuddlebuggery - "I’m walking away with feelings brewing a special pot of 'meh.'" Dear Author - "It might not satisfy everyone who reads it but it certainly has made me think." It's All About Books - "I loved it. The people buzzing? They were right." Pretty Books - "Eleanor & Park is authentic and realistic, right down to the teenage awkwardness and self-awareness that Rainbow Rowell is known for." Romance Around the Corner - "It’s not a perfect book, far from it, but I highly recommend it to everyone." I am so glad that you did eventually read Eleanor & Park and that you loved it so much. I was a bit apprehensive going in, too, but immediately I was sucked in. It's such a wonderful book! So am I! Once again I kick myself repeatedly for waiting. But wow. I <3 it so much. I loved this book so much!! From the pop culture, to the way that even now in my early 40s I could relate to Eleanor, to the emotion of the budding relationship to....well, the whole book really! I still haven't read Fangirl though. Probably should do that. I already know that I wasn't in the right mood for this book when I read it, and so it didn't go over the way it probably should've. But. Even so, I know what you mean about not being able to set it down. It quietly demands your commitment, I think. That's the thing! I really feel like you can be any age and E&P are just as present, just as real and relateable. Such a feat. Yeah, I saw that it wasn't a home run for you. S'okay. I know my mood gets the best of some books sometimes. But yeah. Committed I was. You read Eleanor And Park! WHOO HOO! I DID!!! I'm so glad I did. Everything about it. Just . . . everything. I was such a goner from page one. Ahem . . . would you hand this to a 14 year old? So there is some strong language and Eleanor's stepfather is a Bad Dude. Nothing happens, but the implications with him are dark and his treatment of her mother off stage is lame. This is all balanced by the incredible sweetness of E&P's relationship. All in all, I'd prob wait for 16.